Want a great place to start your canoeing journey? Master the art of the open canoe as you will learn the skills required to pilot your craft, watch wildlife and enjoy the scenery. 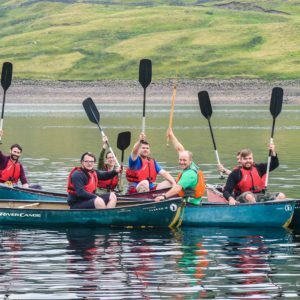 No previous experience is necessary and we provide all safety equipment and can teach canoeing for beginners – making this an ideal activity for people of any age or skill level. Friendly, experienced and qualified instructors lead all our canoeing sessions. How Stean Gorge has sole rights to use Yorkshire Water’s Scar House Reservoir. This makes it the perfect place to learn how to canoe in a stress-free environment and have fun with your friends. This is one of the only places to go canoeing in Yorkshire so come and make the most of the gorgeous landscape and have an exhilarating day learning a new hobby! What’s the difference between canoeing and kayaking? In canoeing, the paddler either sits or kneels and uses single-bladed paddle. Canoes are open-decked. Kayaking is using a boat where the paddler faces forward with the paddler’s legs in front of them using double bladed paddles. Some kayaks have closed decks. Multi-day canoeing expeditions and river trips can also be provided for groups of 8 or more. A typical trip takes place along the River Ure and River Ouse taking in the scenery from Ripon to York. We will start the day with safety tips and instructions on how to paddle a conoe and basic steering techniques and then we will get you in the water and let you have an explore! Ideal for friends and family groups, hen and stag parties and school and college groups. This 3 hour experience costs £45 per person with sessions starting at 09.30 am and 2pm daily. Please arrive approximately 30 mins early to complete medical forms. You will need to have a basic fitness level to participate in this session. If you want more of a challenge talk to our team about arranging a visit to more challenging white water locations and try tackling some rapids. Of course! Anybody aged 7 or over can take part. Individuals and groups are able to book, as there’s no minimum number to book, just make sure you book in advance. This is an ideal choice for a family gathering, corporate event, or a stag/hen party with a difference. You’ll meet the instructors in the reception area of How Stean Gorge. The canoeing will take place at Scar House Reservoir a short drive away. Please note: you will need to provide your own transport to and from the Reservoir. Bring a set of spare clothes just in case you get a little bit wet. Wind and waterproofs may also be appropriate depending on the day’s conditions. Wellies tend to be the best footwear as you can paddle out a little way to step in and out of your Canoe whilst staying dry. All safety equipment is supplied by us. Join us for a spectacular two days - let's do the Yorkshire Canoe Expedition!